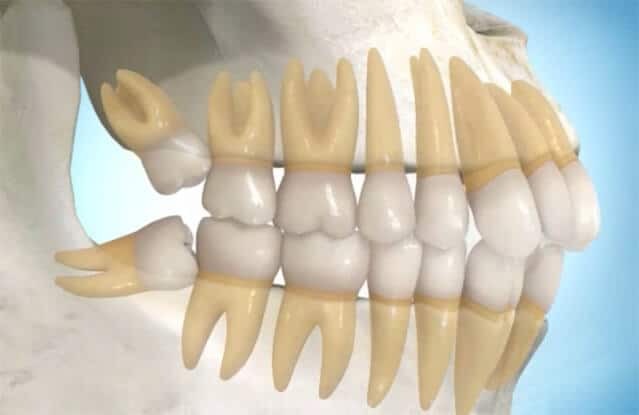 If you get you third set of adult molars (known as wisdom teeth) it’s possible you don’t have enough space or they are coming in at an odd angle. These wisdom teeth often lead to pain, discomfort and infection. So it’s a common questions people ask -why do we have wisdom teeth? Is there a point to these teeth that give us so much trouble? There are a few theories behind why we have wisdom teeth. In the past humans are raw and rough foods. Our diet involves much tougher and raw vegetables and meats, and grittier foods as well. This diet caused more wear to human teeth. This meant we needed every single tooth available to chew well. 1. Given that our diets used to be rougher and wore teeth more quickly, there was more space for the wisdom teeth as the other teeth wore down. 2. The other main theory behind why wisdom teeth don’t fit anymore is that our jaws have slightly reduced in size over thousands of years. Most of us will get four wisdom teeth (making up 32 total). Not everyone has wisdom teeth, in fact some people don’t have any at all. It is not uncommon for people to only have two or three wisdom teeth total.